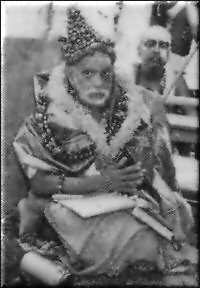 His Holiness Sri Chandrasekarendra Saraswati Swamigal was the 68th Pontiff of the Kanchi Kamakoti Peetam. One of the most glorified saints the history has ever witnessed, He was a Realized Soul. 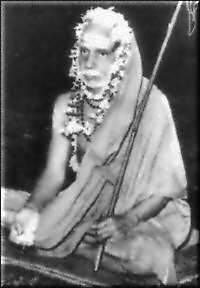 Humility and simplicity were hallmarks of this great Avatara Purusha.Lovingly called as ‘Maha Periyava’ or ‘Paramacharya’, the Mahaswami ascended the Peetam in 1907 at the age of 13. Intensively educated in all the Vedas and Shastras, He was multi-lingual too. Throughout the century that He was in his mortal form, gracing the world, He traveled the length and breadth of the country by foot spreading the fragrance of Sanathana Dharma and the glory of the Vedas. Thiruppaavai and Thiruvempaavai were composed in the Tamizh month of Maargazhi. So they are sung in ‘Ushat Kaala’(early morning) during Maargazhi. Thiruppaavai was composed by Andal and Thiruvempaavai by Manickavaachagar. They are sung in the worship of the Lord because it was in Maargazhi that these two took shape. Thiruppaavai is thirty in number but Thiruvempaavai is only 28 as Siva ‘aagama’ is only 28. Leaving aside the ‘stuti’ Thiruvempaavai together with Thirupalliezhuchhi consists of 28 verses. Even today Thiruppaavai and Thiruvempaavai competitions are held in schools. Today, their records are played in all the temples. The credit for making these two popular goes solely to Kanchi Saint Sri Chandrasekarendra Saraswati Swamiji (Mahaswamiji). Of all the (Adi) Sankara Jayantis celebrated two have been very special. They were celebrated in a large scale. One was in Pondicherry and the other in Tiruvidaimarudur. Once, in Pondicherry, Adi Sankara Jayanti was celebrated with the procession (‘purappaadu’) of Sankara’s picture. At that time Pondicherry was ruled by the French Government while the English ruled the other parts of the country. Many French and English bureaucrats used to visit Maha Periyava and this celebration was attended by both French and English officials. The French stood on one side while the English on the other. And the Indians stood in another line. Mahaswamiji invited the foreigners because Adi Sankara was Jagadguru! It was for this reason (that Adi Sankara was Jagadguru) that Mahaswamiji desired that all – the Indians, the English and the French to participate together in that spectacular event. Once, during Sankara Jayanti celebrations in Tiruvidaimarudur, Mahaswamiji had invited renouned scholars. He conducted Thiruppaavai and Thiruvempaavai conference (‘maanaadu’) and asked the popular carnatic singer M.L.Vasanthakumari to cut a disc. It is these records that are very popular today. Tamizh Poets participated in Tiruvidaimarudur celebrations. Mahaswamiji said that Thiruppaavai and Thiruvempaavai are our two eyes. Poet U.V. Swaminatha Iyer corrected him, “Kann illai! Paavai!” (Not eyes but the ‘pupils’). Mahaswamiji immediately appreciated it, “Nanru Pandidare! Nanru!” (Well said, Oh! Poet, Well said!) Mahaswamiji used to converse with those Tamizh Poets in their own style of pure Tamizh (‘shudha Tamizh’). One should not forget that the popularity of Thiruppaavai and Thiruvempaavai is only due to Mahaswamiji.